More bonus updates this week to celebrate my bday on wednesday; enjoy! He's ranking them at how well they did at magic? Heck, I'm more impressed by Garth hearing the comments while awarding points, and then being able to respond to all of them in order. was'nt Felix nickname "Short Fuze" ? Still curious about Noah's maneuver. Of course Garth didn't actually do any explaining today... but I'm going to have to agree with the "about time" part. Maybe princess is second to last because he actually had to *bleed* from his eye to win? I assume that he is ranking them on their mastery of their given technique. Cherry/Gazz displayed total control of Infuse Spirit, while Hevel is close second with Defense and Noah is third place with Mask. To finish this class and be excluded from further Magiball, you then need to win 4x15 points, once you master all four. My Bday is on Saturday. 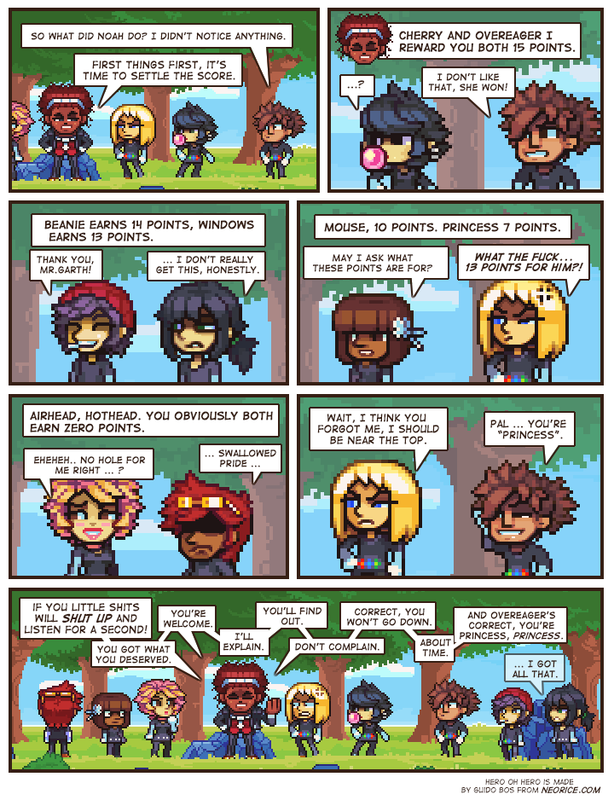 @ -D-: I suspect it's more like Cherry and Overeager are talented generalists, Hevel and Noah are talented specialists (cover and mask respectively), Mousy is a weaker generalist, Princess is a glass cannon, while Airhead can't do it and Felix is Felix. say, when will the vote incentive change? Yeah, but Garth wants to teach them all all four of basic spirit powers. I assume points will reflect that. > was'nt Felix nickname "Short Fuze" ? How well they went about hiding their abilities, combined with their success maybe? I'm guessing 5 points per hit, 1 point deducted per time hit. No points for not finishing. Didn't fully do the math to figure it out, but that sounds pretty close to what the rankings were. I think the point is fonction of the mastery of the 4 basic spirit abilities. "Princess" somehow managed to do aky at focus, even if it cost him a bit. Felix failed to use ANY of those he tried (especialy cover) so 0 for him. and Noah, I think used mask with efficiency, hence the points. Happy near-birthday! My birthday was the 19th :) This stuff is really interesting!